Cmdr Billy J. Headrick, USN Retired, 87, of Oak Ridge died Friday, November 30 in the ICU at Methodist Medical Center. He had been getting physical therapy at NHC in Oak Ridge and was expected to return home on December 5. Cmdr Headrick was the son of the late George B. Headrick and Leola Belle Officer Headrick of Cleveland, Tennessee and sister Wanda Jean Jessie of Madison, Alabama. He is survived by his wife of 64 years, Barbara Anderson Headrick; daughter Dr. Marcia L. Headrick (Richard R. Neel, II) of Townville, SC; son, William J. Headrick of Oviedo, Florida ; Three nieces and their children and grandchildren. 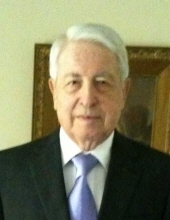 After receiving a Bachelor of Science degree at Tennessee Polytechnic Institute in 1953, he attended Naval Officers Training School in Newport, Rhode Island. Upon completion he served on the N.K. Perry, a destroyer based in Newport. He and his wife were married in 1954 and their daughter Marcia was born in 1955, the day the ship left for a 5 month tour. Cmdr Headrick was later an instructor at the U.S. Naval Academy in Annapolis, Maryland where their son William Joseph was born. Some of his tours included Navigator on U.S. Navy destroyer N. K. Perry, Instructor Navy Officer Candidate School, Instructor in Navigation U.S. Naval Academy, Head of Communications on the US Navy Command Ship Taconic during Bay of Pigs. Attended U.S. Naval Postgraduate School in California, Reports Officer Supreme Allied Commander, Executive Officer Fleet Oiler AO Mississinewa 144, based in Newport, Rhode Island, Staff Commander Amphibious Forces, U.S. Naval Military Advisor to Korean Naval Academy and Navy Staff College, Chinhae, Korea during the Pueblo Incident, Training Officer at Fleet Training Center, Norfolk, VA.
Cmdr Headrick retired from the U.S. Navy in 1974 after serving the country for 21 years. He spent some time after retiring teaching math at Robertsville Junior High and as Operations Superintendent at Oak Ridge Utility. His favorite activity was golf and he was frequently on the Oak Ridge Country Club course where he had been a member for many years. The family will receive friends from 1 PM until 3 PM on Friday , December 7, 2018 at Weatherford Mortuary. To send flowers or a remembrance gift to the family of Billy Joe Headrick, please visit our Tribute Store. 2200 E. Gov. John Sevier Hwy. "Email Address" would like to share the life celebration of Billy Joe Headrick. Click on the "link" to go to share a favorite memory or leave a condolence message for the family.